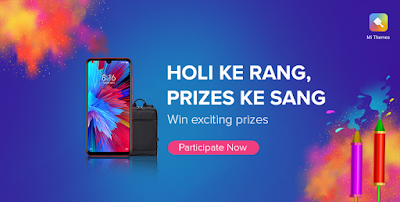 Happy Holi 2019 Play This Holi Contest And Chance To Grab Big Freebie Prizes Like Redmi Note 7 Pro and More. we are announcing the forthcoming of another lovely contest. This Holi get ready to win some mind-boggling prizes. All you have to do is participate in our Holi special Lucky Draw contest to win 49 inch Mi TV, Redmi Note 7 Pro, Mi Bands and lots of other goodies. So are you are ready for some surprise and Holi Dhamaal and Holi Colours Contest. It's time you show some colors! This Holi let's splash the colors of happiness not just on each other but on our smartphones as well. Mi Themes presents an exciting contest to celebrate "Holi ke rang, prizes ke sang", all you have to do is apply a colorful theme and share a screenshot with us and Get Free Redmi Note 7 Pro. One user can win only one prize, in case he/she wins again, next valid entry will be considered as the winner. Only reply with a valid screenshot will be considered as a valid entry. Mi Community reserves all the rights o this contest and to make any changes at any given time without prior notice.